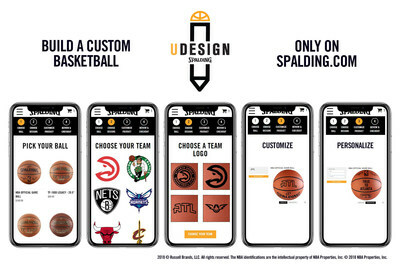 BOWLING GREEN, Ky., Nov. 21, 2018 /PRNewswire/ -- Spalding® announced today the launch of its newest e-commerce feature "U-DESIGN," a basketball customization platform available exclusively at Spalding.com. 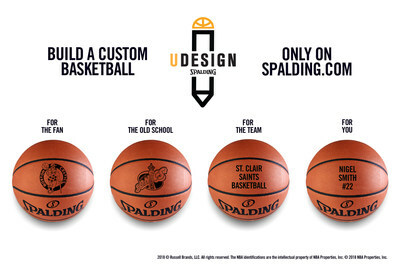 U-DESIGN offers consumers the opportunity to design and personalize a Spalding® iconic basketball, in a unique and interactive online experience. From the gold-standard NBA Official Game Ball to the Spalding® TF-1000™ Series, Spalding.com's new online feature delivers consumers a menu of design options from which to select, including all thirty (30) individual National Basketball Association (NBA) team logos as well as the popular throwback Hardwood Classic® retro NBA team logos. Spalding announced the launch of its newest e-commerce feature “U-DESIGN,” a basketball customization platform available exclusively at Spalding.com. 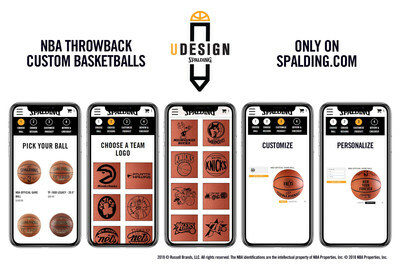 U-DESIGN offers fans the opportunity to design and personalize an iconic Spalding basketball, from a menu of design options, including all thirty (30) individual National Basketball Association (NBA) team logos or add a laser-engraved personalized custom message into the ball’s cover. Spalding announced the launch of its newest e-commerce feature “U-DESIGN,” a basketball customization platform available exclusively at Spalding.com. U-DESIGN offers fans the opportunity to design and personalize an iconic Spalding basketball, from a menu of design options, including all thirty (30) individual National Basketball Association (NBA) team logos, the popular throwback Hardwood Classic retro NBA team logos or add your own personalized custom message. Each U-DESIGN custom basketball will be laser-engraved with your logo at no additional cost. Fans can further personalize their basketball by adding a custom message that will be laser-engraved into the ball's cover. All customized orders created through U-DESIGN will ship in approximately 3 business days, making it one of the fastest custom basketball applications available today. "For almost 125 years basketball has been at the core of Spalding's DNA and we are committed to finding new ways to bring fans closer to the game through innovation, technology and shared experiences both on and off the court," said Matt Day, Digital Marketing & E-commerce Manager for the Spalding brand. "The launch of U-DESIGN allows us to expand our online offering and meet the demand for personalization that encourages our customers to channel their creativity, celebrate a special occasion and leave their mark on the game." For the last 35 years Spalding® has been the official basketball of the NBA. Together Spalding® and the NBA have continued their historic partnership leading to the advancement in basketball and basketball systems technology, innovation and providing unique user experiences for fans to engage with the game we all love. Additional applications to the U-DESIGN platform will continue to evolve throughout 2019 with the twelve (12) individual Women's National Basketball Association (WNBA) team logos, and design collaborations from both creators and brands. Explore the exciting world of Spalding® and new U-DESIGN feature by following us at Facebook.com/Spalding, Twitter @Spalding, Instagram @SpaldingBall and Spalding.com. Russell Brands, LLC, owner of the Spalding® trademark, is the largest basketball equipment supplier in the world. SPALDING® is the official basketball of the National Basketball Association (NBA), Women's National Basketball Association (WNBA), and the NBA G League, in addition to the official backboard of the NBA, WNBA and NCAA Final Four. For more information, visit www.spalding.com.